Sam Shankland is at the top of his game, and his game is chess. He recently was awarded the title of grandmaster-the highest title a chess player can achieve. Spend just a brief time with Shankland, and one will see he is a quick study, extremely bright, determined, focused, and highly competitive. He looks and sounds like the world class chess champion that he is. What's surprising about Shankland is how quickly he has reached the pinnacle of the chess world. He is only 19 years old. "This is just an amazing accomplishment for a teenager. It's almost unheard of," said Mike Hilliard, an Orinda resident and a member of the Board of the Mechanics' Institute Library and Chess Room in San Francisco. Mechanics' is the oldest chess club in the country and helped to foster Shankland's study of the game. Hilliard was on hand along with Shankland's family and a group of chess supporters when the Orinda City Council recognized his chess accomplishments and in his honor designated June 22nd as Sam Shankland Day. "He had to achieve several levels before getting to this highest post," said Hilliard, "Now a grandmaster, the next step [in the competitive chess world] would be vying for world champion." Worldwide there are approximately 1,300 grandmasters, a title held for life. In the United States, there are 20 to 30 active grandmasters. As the newest member of this elite group Shankland, a rising sophomore at Brandeis University in Massachusetts, is taking things one step at a time. "We'll have to see where chess takes me," he says. Shankland grew up in Orinda where his parents Jim and Leslie and younger brother Alex still reside. His father taught him to play chess when he was five or six years of age, but he gave the game little attention until he joined the chess club at Glorietta Elementary School in fourth grade. He quickly mastered all Glorietta could offer and began playing in tournaments by age eleven. "My real strength is my memory," says Shankland who estimates that he is currently ranked about 400 in the world today, but this does not reflect his recent tournament accomplishments. 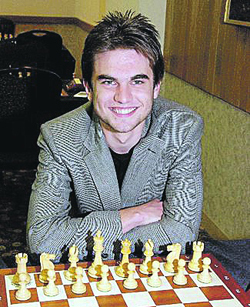 Shankland was the third place winner in the United States 2011 Chess Championships played in St. Louis in April. He was the youngest player in the select field of 16 and lost to the champion, who is 17 years his senior, in the semi-finals. "I love the game and naturally I am a very competitive person. I have always wanted to push myself as far as possible, but I mostly do it for myself," says Shankland who is simultaneously confident and unassuming about his chess prowess. To train he continually studies the game by reading books, analyzing positions, and memorizing moves. He also works regularly with a training partner, a chess player from Norway who he met during his tournament travels. A big part of each game is determining how best to play against the specific opponent, says Shankland. He's disciplined in his preparations and says the opening is key. After taking a year off, once he graduated from high school, to go on the professional chess circuit Shankland settled into university life this past year but was never too far from a chess board. He teaches chess, and because he travels extensively while competing and is otherwise away at school, he works with his students online through Skype. But he also teaches in person and has some high profile clients. He traveled to Abu Dhabi in the United Arab Emirates to privately train Prince Sheik Mohammed in the game. The chess world will have to wait and watch for Shankland's next move. While he plans to complete his undergraduate degree and carry on teaching, the draw of competition continues to pull the young grandmaster to the table. In August, Shankland will compete in the Chess World Cup, in a field entirely populated with grandmasters, to be held in the Russian cities of Khanty and Mansiysk. While it is more likely that preparation, concentration, and inspiration will lead Shankland to the first place prize, we wish Orinda's grandmaster good luck!